When the Financial Express was launched in 1993, the 'dismal science' of economics was still in its embryonic stage across the country. Fast-forwarding a quarter-century, economics must be a glowing subject reflecting Bangladesh's middle-income identity. Encapsulating that transformation must remain one of the golden chapters in the annals of Bangladesh history, shifting from exporting primary products (jute and tea) to low-tech manufacture (RMG-based) first, and now entering upscale manufacturing at the lower-end (off-shore software). Though the Financial Express was not causal to this chain of events, it stands as the foremost chronicler of the country's fundamental economic transformation spanning that time-span. That is an unparalleled credential to be bestowed upon any one Dhaka newspaper, but Moazzem Bhai earned those accolades at the helm of a pioneering team. Those who have witnessed every step of Bangladesh's economic growth should be able to say the country has been on a roll since its return to the civilian rule. Clearly, the comment is not papering over the problems we have faced (and continue to face): fiasco every time an election is held; oborrodhs (shutdowns) grinding routine activities to a halt, but even worse, breeding fear among domestic investors; a brief military take-over; and a terrorist incident that pulled the rug on inquisitive foreign investors. More could be added if we have the yen to hear, but the point should not be missed: in spite of these, and because of the RMG (ready-made garment) pacesetting production space, Bangladesh boasted what only a dozen odd other countries could: an average 5.94 per cent annual growth rate from the moment Moazzem Bhai launched this enterprise until he went back 'home'; and that Bangladesh could cross the 7.0 per cent annual growth-rate threshold in 2016 (only to spiral up towards 8.0 per cent in 2017 -- 7.86 per cent to be precise), only means that forward march is picking up momentum. True, Moazzem Bhai was no magician, nor did he have a Midas touch on the economy. Yet, no other journalist could match his envious capacity to convert into crisp narratives on a daily basis of what he saw first-hand of this miraculous growth. During that span, GDP/capita trebled, as too GDP/capita PPP (parity purchasing power). Turning to specific sectors, GDP growth in construction more than doubled over that period, in manufacture by over 250 per cent, as too in mining, while those in services, transport, and utilities doubled. Only GDP growth in agriculture fell short: it grew by only 50 per cent, a laudable but lagging growth comparatively. RMG exports, accounting for 15 per cent of the country's GDP (and 80 per cent of its exports), with remittances contributing another 8.0 per cent of GDP, accounted for much of that: the apparel sector chipped in through low-level assembly plants and industrial start-ups, as too remittances by expanding the demand for ordinary household goods. In addition to boosting exports and building foreign-exchange reserves, they multiplied consumption, especially through home construction, with the apartment-building revolution from the early 1990s being a huge component of that housing revolution. This, in turn, fed such consumer goods as ceramics, draperies, furniture, and sanitation wares, among other things. Economic unfolding of this kind was constrained by such factors of long-term pain (if not corrected): spiralling real-estate value, making Dhaka property among the priciest in the world; conspicuous consumption, as a consequence of which diabetic and other similar health problems have also magnified in incidences, treatment, and expenses; and a rampant boost in imports, mostly of high-value final consumer products, such as automobiles, electrical components, and so forth. Even more of a long-term concern has been the relative ignorance of infrastructure needs. Until the Hasina administration plunged deep into this area through mega projects, built, too, on largely public funds, the country was being saturated to break-point in finding continuous energy supply for its factories, transporting finished products from hinterland factories to ports, yet still not expanding port capacities to meet the burgeoning imports and exports, and not invigilating bank performance (since today's banking crisis stemmed from the relative negligence, crony interruptions, and inadequate prior safeguards). Bangladesh is fortunate that these ailments have not blown up in its face simultaneously, since that would prove catastrophic for all. Prioritising mega projects so suddenly (though ever so long-overdue), may supply the breakthrough from this accumulating saturation if handled properly. Bangladesh is fortunate to intertwine its own infrastructural crusade with those elsewhere, particular in and across contiguous countries. For example, with road transportation, India has long had projects which are slowly beginning to unfold as part of its 1993 Look East Policy being converted into Act East Policy from 2014. The Bangladesh-China-India-Myanmar (BCIM) highway project has been on the drawing board from 1999, as too the Kunming-Kolkata Highway from 2012 and Hanoi-Kolkata Highway from 2013, but may receive greater attention now that the 2002 India-Myanmar-Thailand Trilateral Highway is under construction. These require border friendliness with Bangladesh and corresponding actions within Bangladesh. Sheikh Hasina's mega projects fit in right here. Many dealing with infrastructure have been placed under the public-private-partnership (PPP) framework from 2008. Unwrapped when Hasina's administration began, the PPP framework involves a gestation phase going back to when Hasina was prime minister previously, in the late 1990s. Footwork began by creating a PPP environment through the Private Sector Infrastructure Development Project in 1997, followed the next year by the Infrastructure Development Company Limited, and the next by the Infrastructure Investment Evaluation Center. An inter-ministerial Private Infrastructure Committee was established in 2004, while the Bangladesh Bank created the Investment Promotion and Financing Facility (IPFF) four years later, with a $4.18 billion fund. From the PPP beginning, transportation dominated allocations, receiving over one-third, followed by healthcare and economic zones with 8.0 per cent each. This was helpful since, when the 21st century began, only 10 per cent of Bangladesh's 201,182 km of roads belonged to a 'primary' class, even then not feasible enough for the heavy-duty transportation needed now; only one-third of its 2,745km rail-lines were broad-gauged; and the country only had three ports: Chattogram, Dhaka, and Mongla, with Chattogram accounting for three-quarters of imports and exports. Between 2011 and 2020, Hasina's transportation infrastructural expenditures range from $74 billion to $100 billion (or 7.8 per cent to 10 per cent of gross domestic product), so that the 0.1km per 1,000 persons today can be drastically expanded in the very near future. Among the mega projects are the $2.9 billion Padma Bridge, the $3.5 billion Padma rail-link whose construction-work the prime minister just inaugurated, and the $2.2 billion Dhaka Metro Rail, since a vast majority of the country's RMG plants lie around this metro capsule. Among these, the Padma Bridge is crucial to any highways from India to Southeast Asian countries not to mention the Seven Sister States in its northeast. Padma Bridge also brings port-access closer to Dhaka than Chattogram has been, while also strengthening the case for the $3.7 billion Bangabandhu International Airport construction in and around Faridpur. With a $11.4 billion tab, Payra Port with a railway connection, would be the targeted outlet from Dhaka, while over-congested Chattogram Port would also be eased of traffic through the Matarbari Port and fuel generation plant. While India is seriously proposing port load-shedding to Bangladesh through Kolkata, too many border-restrictions may make building alternate Bangladeshi ports a safer future option. While these are the cream projects, even the lesser discussed projects draw a lot of attention (and not necessarily for traffic congestion): the $1.4 billion Dhaka-Ashulia elevated expressway from last year; Joydevpur-Ishwardy, Joydevpur-Mymensingh, and Akhaura-Sylhet railways, adding another $3.0 billion to the bill, and the $2.0 billion Dhaka-Sylhet Highway. Even grander is the Dhaka-Chittagong Elevated Expressway, while another rail-line linking the country's two largest cities is also in the pipeline. While these speak for hinterland development, the $1.8 billion Dohazari-Cox's Bazar rail-link and the $2.8 billion Shitakundu-Cox's Bazar 160-km Marine Drive open up the coastline, just as the $250 million Mongla Port modernisation project augments Matarbari and Payra port construction. That these open up an entirely different chapter on foreign economic support and the geopolitics that entails (mostly abroad rather than within), it is clear Bangladesh will be speaking with a louder commercial and integrated voice given the market openings that automatically follow infrastructure-building. That they also help reduce export transportation and port-storage costs that eat away a huge chunk of our hard-earned foreign exchange also expose the windfall effects possible. Jobs, more production, construction, and money-circulation, as well as external connections may be revolutionised. Some spin-offs should raise eyebrows. With bridges, expanded highways, railways, ports, a new airport, and plenty of energy producing projects, Bangladesh can (a) enter the global market by land; (b) open more domestic markets, and particularly boost the multiple border-haats being slowly implemented; (c) expand trade with India by including multiple different products, but simultaneously expand trade with China, with the outlying hope of using one country to balance the other in order to thwart dependence; (d) initiate more Southeast Asian trade utilising India's highway projects already earmarked head in that direction; and (e) attract new investment opportunities, not just those being talked about, such as software off-shore production, but also hard-core ship dismantling yards; and so forth. As the essay shows, Moazzem Bhai was not looking at a blank mirror. If he was at the start, we now see how that mirror has gotten all cluttered up. That is just one indicator of the enormous yet silent contributions of the Financial Express to this country's history. And that story has just begun. 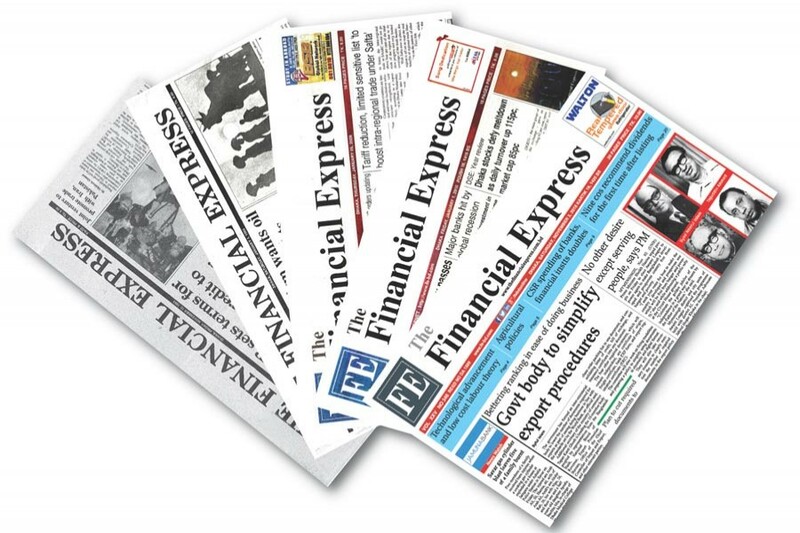 Even if, God forbid, the Financial Express were to pull its shutters down, the next 25 years of this country's economic adulthood cannot be honestly understood, explained, or even anticipated without the country's first and only English language daily economic newspaper. Moazzem Bhai leaves so long a future shadow that even he may not have fully comprehended, but that his legacy will be the choral line on more people's lips over time.